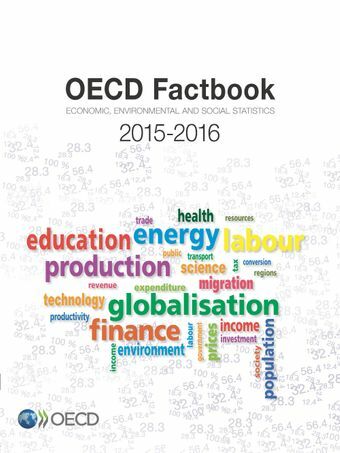 OECD Factbook 2015-2016 is a comprehensive and dynamic statistical publication from the OECD. Close to 100 indicators cover a wide range of areas: economy, education, energy, transportation, environment, development, health, industry, information and communications, population, employment and labour, trade and investment, taxation, public expenditure and R&D. This year, the OECD Factbook includes new indicators on a number of regional indicators including GDP by metropolitan area.Data are provided for all OECD countries, including the OECD aggregate, euro area, European Union, and where data are available, Brazil, China, India, Indonesia, Russia, and South Africa.For each indicator, there is a two-page spread. A text page includes a short introduction followed by a detailed definition of the indicator, comments on comparability of the data, an assessment of long-term trends related to the indicator, and a list of references for further information on the indicator. The second page contains a table and a graph providing – at a glance – the key message conveyed by the data. Each indicator includes StatLinks which allow readers to download the corresponding data.OECD Factbook 2015-2016 is a key reference tool for users working on economic and policy issues.